Serve Richly Flavored Dishes And Impress All Your Guests Thanks To The Ultimate Salt And Pepper Grinder Set! If you are a kitchen enthusiast you are well aware of the fact that spices can utterly transform a dish’s taste, intensifying the flavors and making every bite incomparably delicious. If you want to take your cooking skills to the next level and serve mouth-watering meals that will have everyone’s taste buds tingling, you have come to the right place! 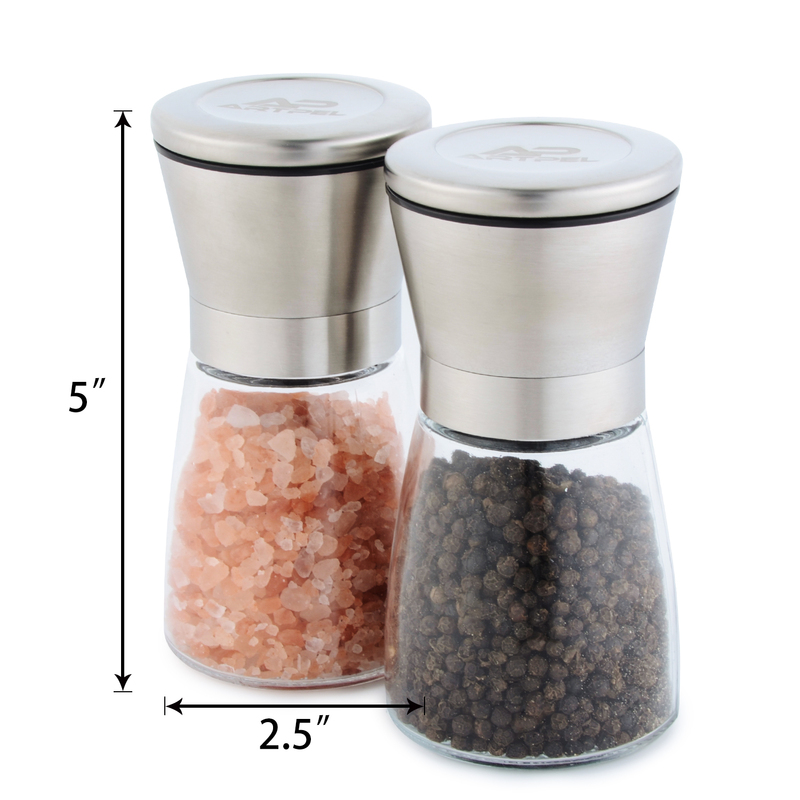 This amazing salt and pepper shakers set is exactly what you have been looking for! These top notch salt and pepper mills feature an elegant, striking glass body that allows you to effortlessly check on their content and make sure you never run out of spices. 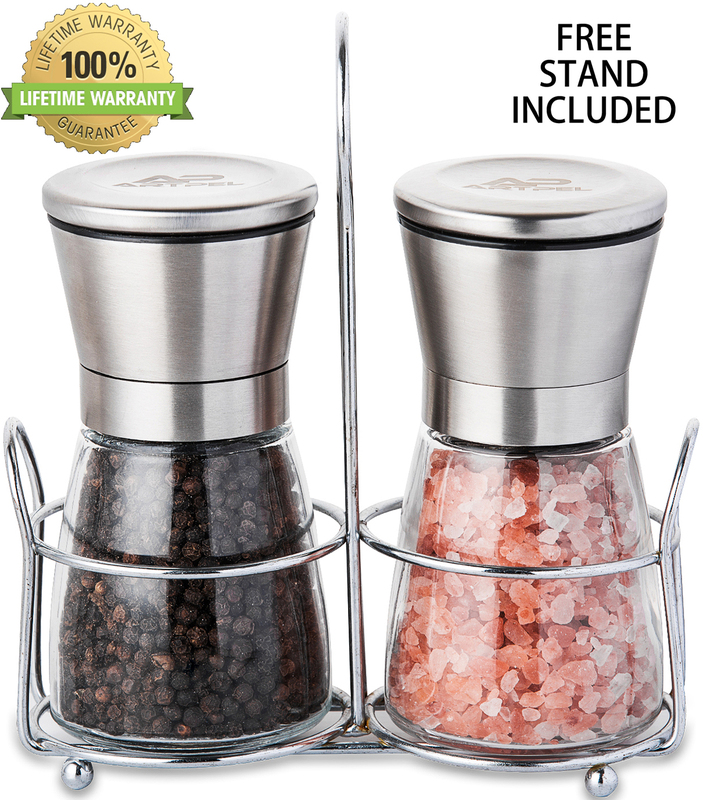 In addition, the durable, brushed stainless steel encasing adds a cool, modern touch, making these salt and pepper dispensers the perfect addition to your kitchen and dining table! The non-corrosive ceramic grinding mechanism which has been carefully placed on the top of the grinder does not absorb or spoil the spices’ flavors, allowing you to fully enjoy your journey to the land of taste. Last but not least, the practical plastic knob at the top of the shakers enables you to pick the desired coarseness and effortlessly adjust it according to your needs! Stop wasting your money on electric grinders and shakers that work on batteries which cost you a fortune! 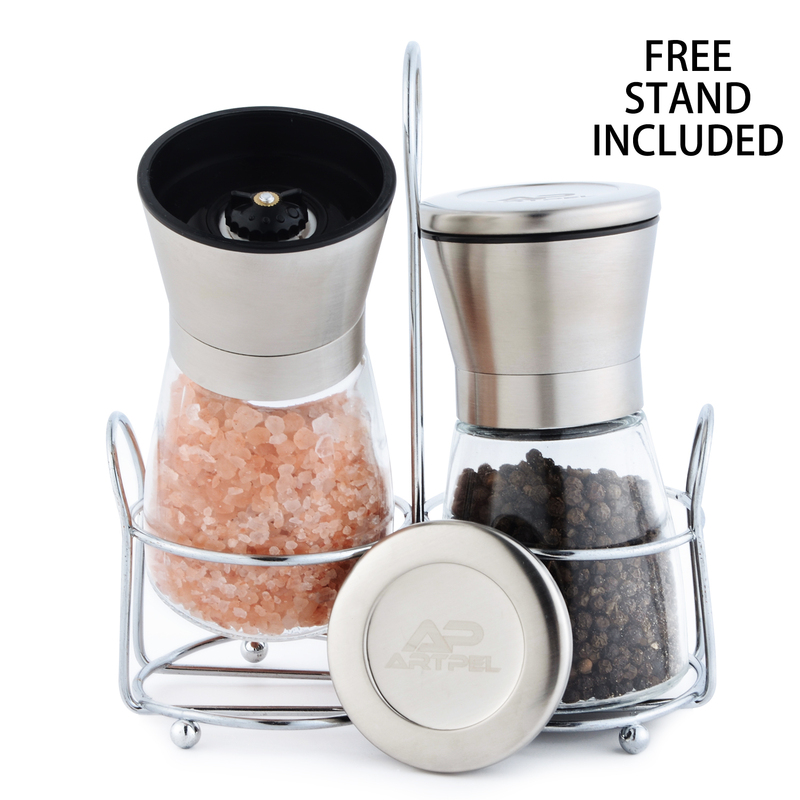 Forget about struggling in order to refill your salt and pepper mills! 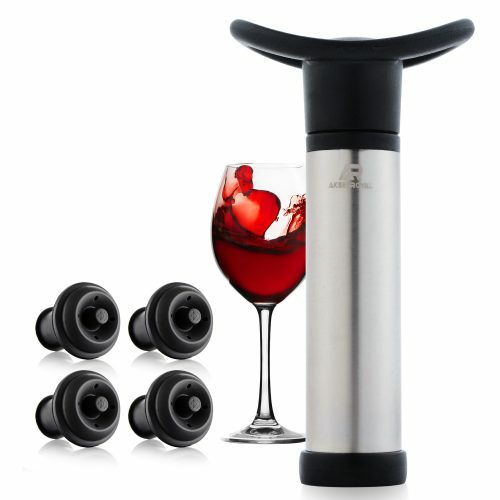 These grinders are cost effective and easy to refill thanks to their 5’’ tall body and the wide opening on their top. 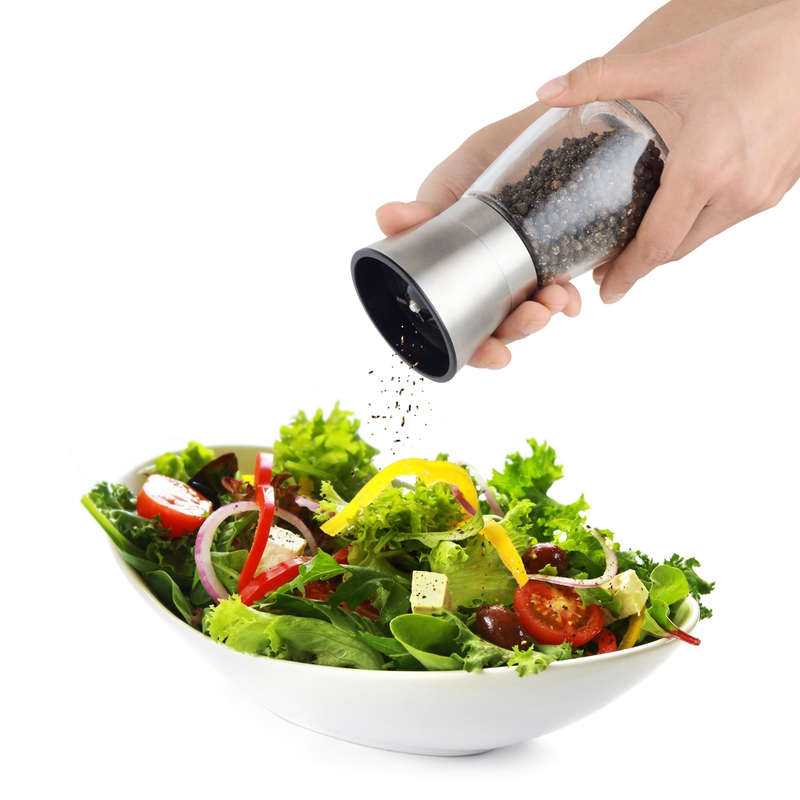 This is a very good combination of salt and pepper grinders that looks very attractive to the eyes and does the crushing job to perfection. As it looks very compact and comes with stand, I have placed it on my dining table. 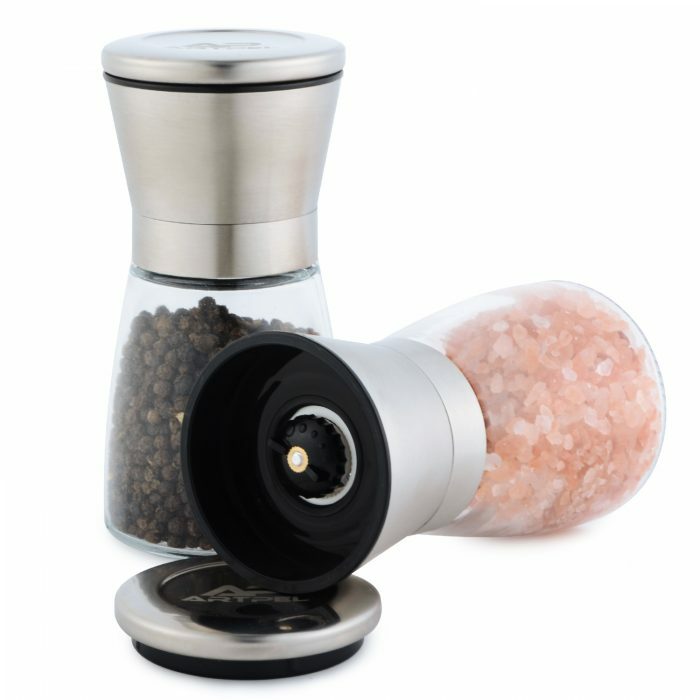 The main thing that attracted me to buy the grinder was the use of ceramic grinding mechanism to grind the salt and the pepper instead of the metal grinders. Hence, it is very safe. I am very impressed with the grind quality and will surely recommend it to one and all. I am a passionate cook and wanted to serve richly flavored foods to my family and guests. 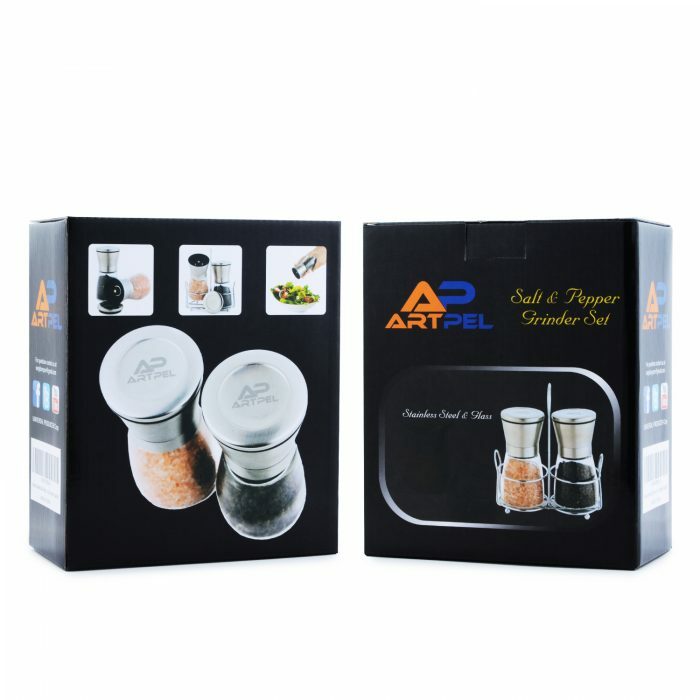 I was looking for a very good salt and pepper mill on the internet and stumbled upon the ARPTEL salt and pepper grinders. This manual grinder looked very attractive to the eyes and looked exactly the stuff that I had in mind. 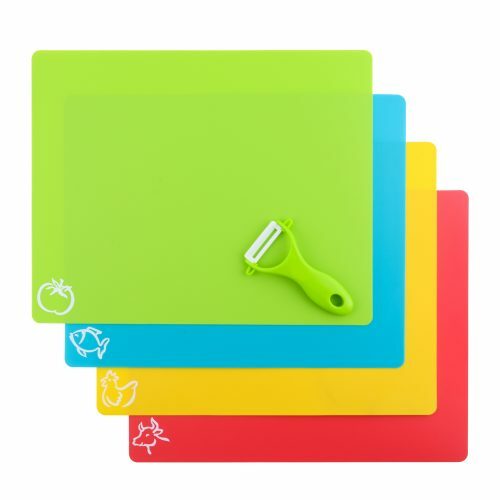 It is a very useful product to use in every kitchen and it enhances the taste of the food very easily. It does not have problems crushing the whole peppers and the sea salt. The flavors of the salt and the pepper are intact as it uses the ceramic grinding mechanism. The pepper and salt grinders are great! Many others I bought in store usually stick and do not work well. However, these ones were pretty good, grinding is very easy and it does not take too much effort. They also look very nice, so its a great decoration for the kitchen. Refilling them is also very simple, just twist off the top and fill with your favorite spices. I tend to use them while cooking soup or meat so that the spices get a little crushed, which adds more smell and taste to the food. The whole house now smells like pepper and great spices when I cook, and my husband can smell when the food is ready, so I don’t even have to call him to the table. 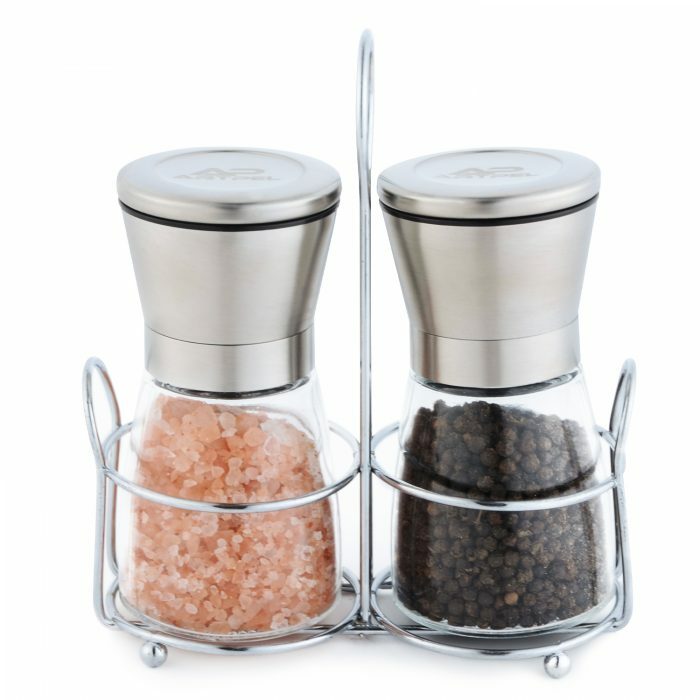 These Akses Royal Pepper and salt grinders are an awesome product! I am a fan of this type of kitchen accessories and tools, and I am very picky about which ones I use. 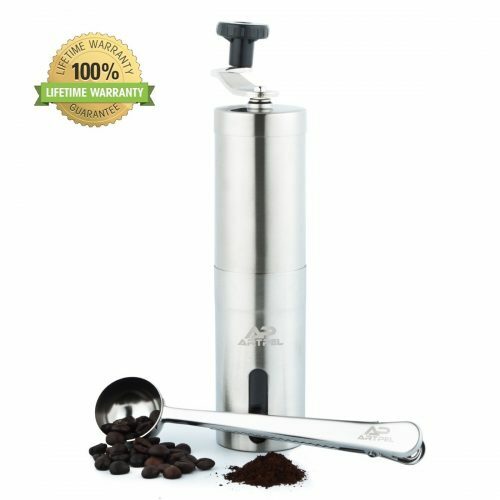 I tried these grinders and they make salt and pepper grinding very easy. They also look really nice and go with just about any kitchen design. I use the grinders very often when cooking, and they tend to be especially useful for adding the best smell and taste to meat. Awesome product! A beautiful set of 2 grinders and a rack for them. 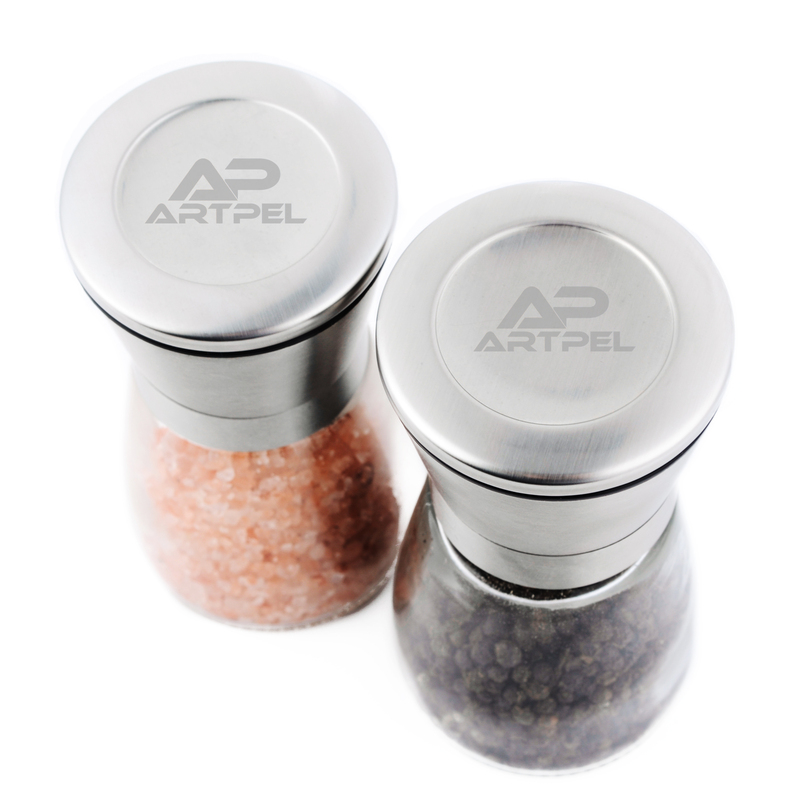 Adds an exclusive touch to the table, easy to use, and just perfect for granulated spices and seasoning. I am a professional cook, and I always want my spices to be sorted out, everything in order, etc. These grinders can be used for so much more than just salt and pepper, such as cinnamon sticks (which I prefer over cinnamon powder). I ordered 3 sets of these and they are definitely the best out there. Refilling is simple and I can easily tell how much is inside and how much I need for a specific dish. Simplicity of refilling is very important to me, because as I mentioned, I am a chef cook so I use a lot of various spices. Grinding the spices adds a rich flavor and smell to my exclusive recipes.